During my younger years, I used to be the "Lydia de Vega" of our class. A little boast here but it's true. I run the fastest. Since then, I always wanted to engage in sports and hopefully pass it on to my children. Last May 29, 2016 at the SM Mall of Asia Concert Grounds was my first fun run ever after I had an operation. I got a go signal from my doctors, so that's a Yay! I was so happy, even more excited because I'll be running with my youngest child, my Unica. It was her first fun run too. What's more awesome is that it's organized by her favorite channel, Nickelodeon. There were 3 categories. There’s the 200M DASH for kids 7 years old & below, 1K RUN for human and dog, and 3K RUN for everyone! Since she's only 4 that time (she turned 5 last June 2) we ran for the 200M dash. Parents/Guardians were asked if we will be running side by side with our kids, or will let them run by themselves. My daughter said that she'll run by herself (what a brave and courageous little girl I've got) . But of course can't resist not to run with her, I just took her video to document her first run. Actually, she almost left me behind. She runs faster than I am. Here's a snippet of the 200M dash run for girls aged 7 and below. 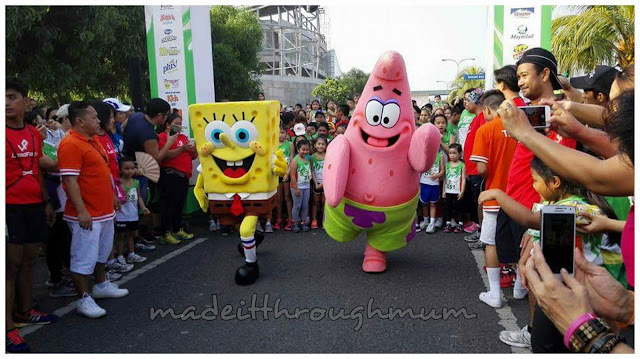 Bikini Bottom stars who also happen to be Nickelodeon's Slime Cup Run ambassadors were also present to join in the fun. The kids and kids-at-heart were thrilled. After everyone's done with the run and passed through the slime tunnel, we headed into the shower area in the Slime Hub to clean off the green goo. 'Twas another memorable bonding experience for me and my daughter . Grateful for takbo.Ph for inviting us to part of the first- ever run of Nickelodeon for the whole family.